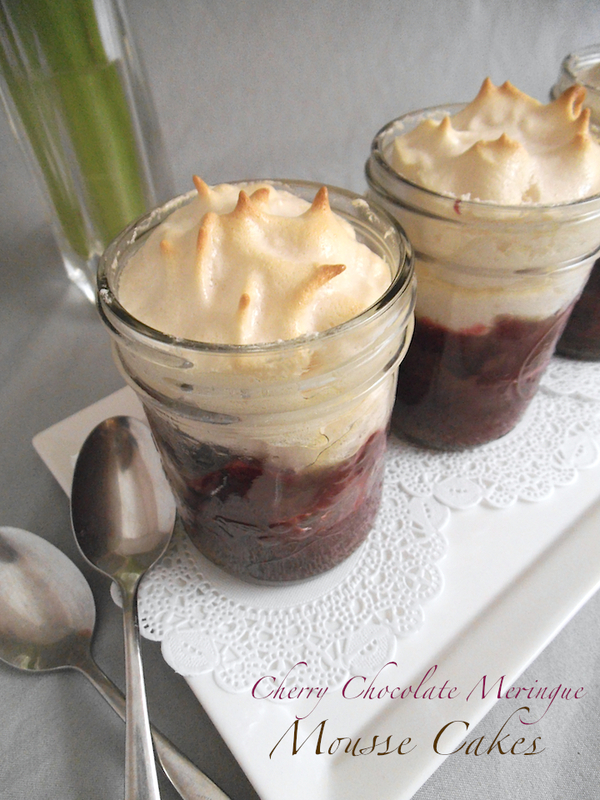 Cherries and chocolate and fluffy meringue create a layered dessert that is decadent, delicious, and healthier than anything like it! The delicate sweetness comes from natural sources rather than refined sugar, freeing you to indulge without worry. So grab a spoon and let’s dig in! Place chocolate banana cake batter ingredients in a food processor or high-speed blender container. Puree until smooth, pausing to scrape batter from sides as necessary. Grease bottoms of small Mason jars. Fill 1/3 of each jar with batter. Microwave in batches of 3 jars for 60 seconds. Reposition jars if necessary. Microwave for another 30 to 60 seconds. If needed, microwave another 30 seconds. Cake should remain moist. Allow cakes to cool for a minimum of 5 minutes. If making your own cherry filling, add cherries, juice, coconut sugar, maple syrup, and tapioca or cornstarch to a small to medium saucepan. Heat over medium low heat, stirring continuously, until thickened, about 7 to 9 minutes. Remove from heat and let cool. Beat egg whites and salt together with an electric mixer until soft peaks form. Add honey or syrup and beat until incorporated. Add sugar and arrowroot flour and beat until stiff peaks form. Preheat oven to 325 degrees F (170 C). Layer cherry filling over chocolate banana cake, until each jar is 2/3 full. Add a meringue layer to fill the jar (this will rise when hot and then shrink back when cooler). 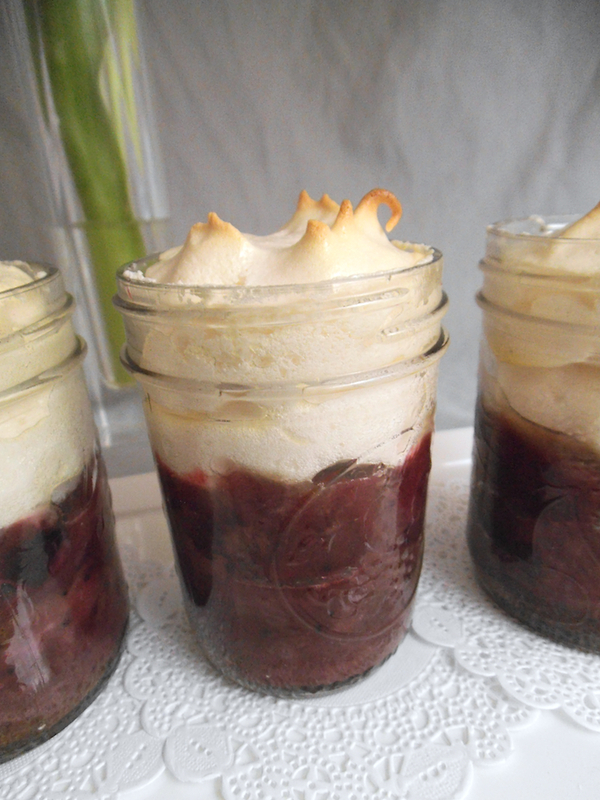 Bake the jars for about 10 minutes, until meringue turns light golden brown. Let jars cool before serving slightly warm or at room temperature. I‘m bringing this dessert to Fiesta Friday and Savoring Saturdays. I also share recipes at Allergy Free Wednesdays, Gluten Free Wednesdays, Corn-free Everyday, and here. Yum … can’t wait to try this recipe out! 🙂 Thanks! Thanks! Jars make it fun because you can see the layers of goodness! You don’t have to tell me to grab a spoon twice! 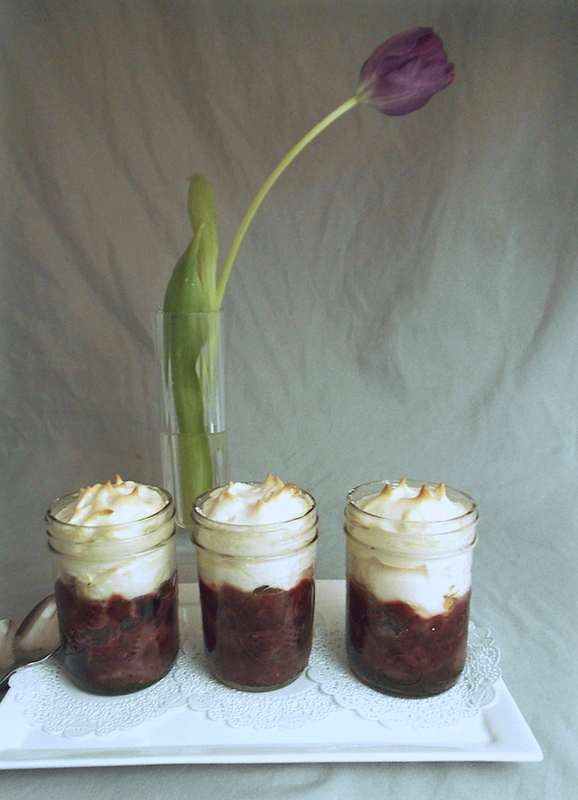 These little cakes in a jar are adorable and the flavor sounds fabulous. 🙂 That meringue topping looks absolutely perfect! Thanks for sharing your delicious recipe with all of celebrating the Fiesta Friday Anniversary! It’s my pleasure! Thanks for stopping by! A sweet that is described as being somewhat healthy is definitely going to get my attention. Right! I like having something sweet that is healthy enough to eat any time. Meringue is so nice when it turns out well. Enjoy! Love these jar recipes – makes all my hoarding worthwhile! This looks really delicious and very worthy of a special occasion too! Happy Fiesta Friday! What a yummy dessert! My family goes crazy over cherries and chocolate so they would love this. Thanks so much for bringing it to Fiesta Friday! You are very welcome, Shari! Delicious dessert and so pretty! Perfect for FF! This looks so super yummy and so cute! Done! Thanks for the invitation! 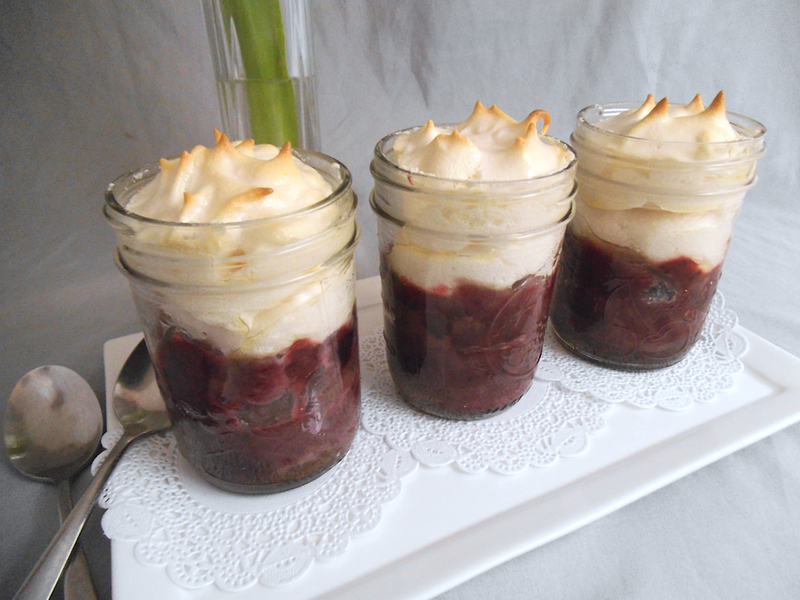 Your dessert looks so pretty in the jar and looks yummy too! Thanks for sharing on Merry Monday. Thanks, Erlene, for hosting such a fun party each week! Love the presentation in the jar! 🙂 So cute and clever. This looks so pretty, Julia! I love all the layers in this dessert! The chocolate banana cake sounds phenomenal with the cherry filling and meringue! What a great idea to serve it in a jar too – looks delicious! Thanks so much, Raia! I hope you enjoy them! I found the cake part stayed moister when I used coconut flakes, BTW. What temperature is the oven for the meringue please. The meringue is baked at 325 degrees F (170 C). Enjoy! Thanks, Laura! I’ll be back! I’m a sucker for anything in a jar! 🙂 Sounds wonderful!